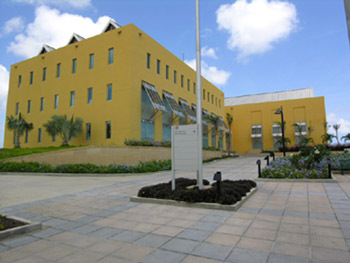 Caribbean news are reporting today as “apparent suicide” the death of the Regional Security Officer (RSO) of the US Embassy in Barbados. POLICE ARE INVESTIGATING the apparent suicide of a 51-year-old United States Embassy security official. The body of American George Gaines, a Caucasian male, was found at White Sands Beach, Dover, Christ Church, around 8:30 a.m. yesterday with a bullet wound to the head. The discovery was met by an immediate response from United States government officials, including Chargé d’Affaires for Barbados and the Eastern Caribbean, Christopher Sandrolini, who was among those gathering at the scene. When a team from the SUNDAY SUN arrived, Gaines’ body, partially covered with a white sheet and clad in khaki pants, white socks and suede boots, lay a few feet away from the sea, in a bushy area of the beach. In June 2011, Nation News did a piece on George Gaines and his family (see Reaping big Gaines: Close-knit family of three makes time to play together). According to that family profile, Mr. Gaines served in Thailand, the Netherlands, Croatia and was on domestic assignment for five years. He has also served in the US military. He has an adult daughter and has been married to his wife of over 20 years. A separate item online indicates that his most recent assignment in the U.S. is reportedly as the Professional Responsibility Division Chief, in the Office of Investigations and Counterintelligence at the Department of State from 2008-2010. As of this writing, the embassy has yet to release a statement. And we have yet to receive a response from our email. We will update if we learn anything more.